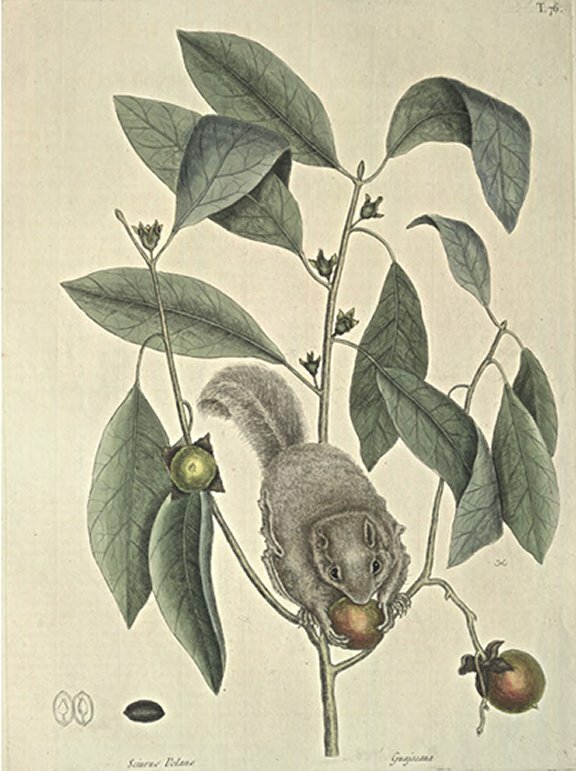 This is about the Size of the Ground Squirrel, but has a somewhat shorter Body and Head; The Ears were round, the Eyes black, and large; the Body covered with very fine Hair, as soft, tho' longer than that of a Mole, of a light Mouse Dun Colour: The Tail long, broad, and flat, the Hairs of it exceeding fine and soft. These Squirrels have not membranous Wings like those of a Bat, whereby they can fly to any great Distance, but have only Membranes, covered with their Furr, which grow along their Sides, and are attached to their Legs, by which they can expand them, and so help themselves in leaping from one Tree to another, as I shall mention in the following Page. These Species of Squirrels hath been lately discovered in Poland, an accurate Description and Print thereof, communicated by the ingenious and curious Mr. Klein, Secretary to the City of Dantzick is published in the Philosophical Transactions, N 427. p. 32. These Trees are from fourteen to eighteen, and sometimes twenty Feet in Height, with a Trunc seldom above ten Inches thick, and Leaves like those of a Pear. In April the Blossoms appear, growing along the Sides of the Branches, on very short Footstalks; they are monopetalous, succulent, and of a green Colour, divided into four Segments, in the middle of which stands the Ovarium, which when grown to their full Size are nearly as big as Orleance Plums: As the Fruit swells the four Petals, which composed the Flower, spread, and become hard and dry. The Fruit, which is of a transparent reddish yellow Colour, incloseth four flat Stones. These Trees grow plentifully in Carolina, Virginia, and most of the Northern Colonies in America, and are lately become naturallized to our Climate, having here ripen'd its Fruit in the open Air. The Fruit of these Trees are ripe at different Times, some in August, others in November, and will hang after the Leaves are dropped till December; the Fruit having then lost much of its watery Parts, is shrivelled, candied, and very luscious, resembling in Taste and Consistence Raisins of the Sun. The Fruit of these Trees are a great Support to Birds, Squirrels, and various other Animals. The Stone split in two Parts exhibits the Tree in Embrio, with its Stem or Trunc, with the two Folia Seminalia, in a more conspicuous Manner than in any other Seed I have ever met with.